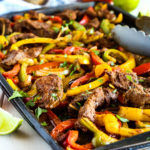 These Easy Sheet Pan Steak Fajitas make the perfect simple and healthy weeknight meal for busy families, on the table in 25 minutes or less! Drizzle the olive oil on a large sheet pan. Add the sliced onions, sliced bell peppers, and thinly sliced steak to the sheet pan, along with the taco seasoning, paprika, chili powder, and lime juice. Using your hands or a pair of tongs, toss everything together well until the meat and veggies are well coated in the seasonings and the oil. Bake at 400 degrees Fahrenheit for about 12 minutes, or until the veggies are becoming soft and the steak has browned on the outside. Be careful of over-cooking the steak (nobody likes dry steak!) - test a piece after 10 minutes to be sure it's cooked to your liking. Serve in tortillas with lettuce, tomatoes, cheese, sour cream and avocado, as desired (use the time while the fajita filling is baking to prep these ingredients).